the steel drum exco is offered every semester to any interested college and conservatory students. non-students are sometimes (but rarely) accepted, depending on space. we can only accept about 20 students and often over 80 apply, so don’t expect to get in on your first try. to apply, stop by our table at the exco fair, meet the current semester’s teachers, and fill out a short application. no experience is necessary (we try to select a good combination of people with diverse musical backgrounds, including those with no steel drum or musical experience). 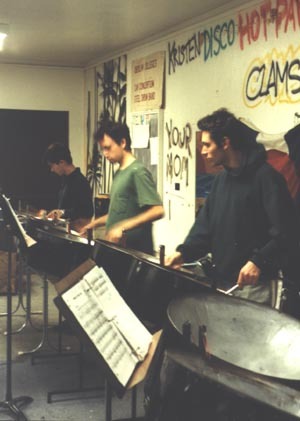 taught by two or three members of oberlin steel, the exco is more of an ensemble than a class; we teach fundamentals of playing the steel pan as well as the history of the instrument. we meet once a week for two hours, with additional practice time required. the class is graded credit/no entry (or pass/no pass) for your choice of 0 or 1 credit hours. at the end of the semester, interested students are encouraged to audition for oberlin steel.